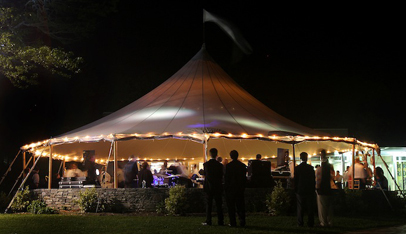 The 14 m Round is often used for smaller dinner parties, barbecues, or cocktail parties. It can accommodate up to 80 guests at 150-cm round tables of eight. Seating capacities vary as some events require a dance floor, catering tables, and/or bars. The first diagram shows a cocktail party or rehearsal dinner for 96 guests at tables of 8 with an 2.5-m bar and 5.7-m catering table. 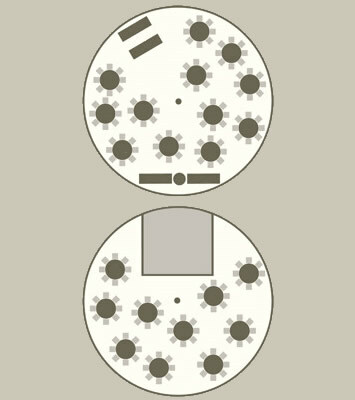 The second diagram shows a dining and dancing event with a 5 x 5 m dance floor. This layout accommodates 80 guests at tables of 8.